Zadní koberce zavazadlového prostoru černé kit. Koberce překrývají zadní podběhy a sahají k hraně pod sklo. Aplikace lepením (např. chemoprén). 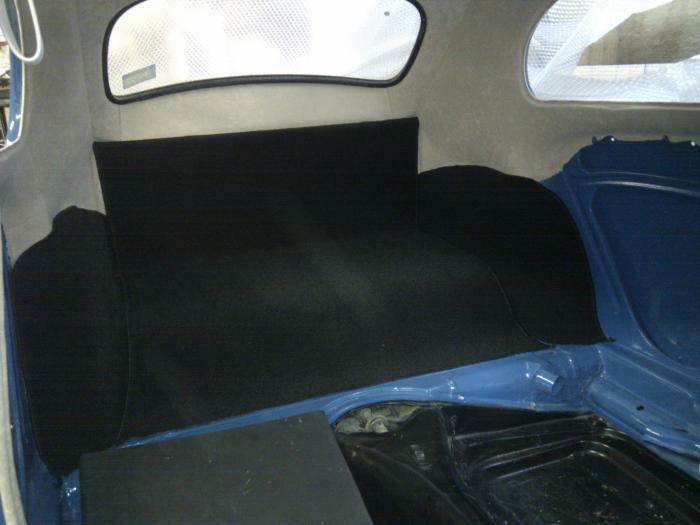 Carpet kit rear compartment black. Litter Box carpet sets, also for the litter box (behind the back) is a suitable carpet set available. For years of construction from 8/1964 is also the back of the rear seat upholstered and extends below the rear window. There is even a carpet kit in case you do not want to mount the rear. The whole is neatly ticking just as the interior carpet sets. Also, this set should be like the interior set are glued. Zadní koberce zavazadlového prostoru šedé kit. Žaluzie na zadní okno komplet. Rear window blind.